The best laser printer should print quickly while maintaining precise text and simple graphics. It should be easy to maintain and work efficiently without a lot of bells and whistles. 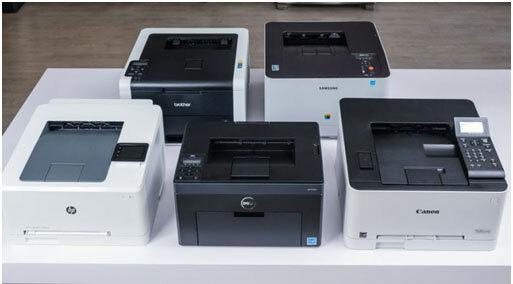 To find the best, we spoke to IT experts, scoured consumer reviews, investigated specs, and gathered the top laser printers from reliable brands. We then ran them through a gamut of print quality and usability testing and compared their results with a magnifying glass. 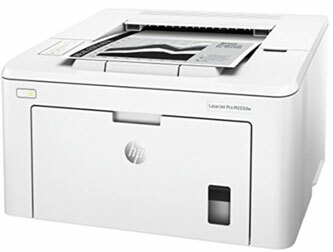 The HP LaserJet Pro M203dw printer is our pick for the best black and white laser printer because it excels at printing crisp text and sharp lines for graphs and charts. Pretty simple. Outside of wireless connectivity, the printer doesn’t offer any features, but we don’t mind because using the printer and replacing toner or paper is painless. 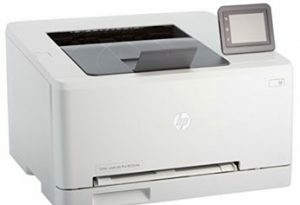 It’s more expensive than others on the market, coming in at $200, but If you want to quickly print documents with consistent high quality, the HP M203dw is a solid bet. Our pick for the best color laser printer is the HP Color LaserJet Pro M252dw. This printer surprised us with its ability to produce vibrant colors, and even high-resolution images, accurately. The color is a bit dark, but with sharp text and clean lines the HP Color LaserJet Pro M252dw outperformed all the other color printers we tested. At $300, it’s not cheap, and it will require additional color toner cartridges. But its crisp results and features like an intuitive touchscreen for checking toner levels or calibrating the printer make the HP M252dw a great pick for daily printing needs. Don’t use bargain or knock-off toner. Toner is expensive but all of our experts warned us against using knock-off or bargain toner. Leon told us that “using brand toner would be highly advisable as recycled toner tends to explode and spread throughout the printer.” While toner can be expensive, buying the correct cartridge from your laser printer’s manufacturer will prevent heartache in the future. Black toner cartridges can cost between $60 and $90 but typically last for 2,000-3,500 pages. Color printers use four CMYK toner cartridges instead of one black cartridge. The cyan, magenta, yellow, and black cartridges (CMYK) can replace separately and typically cost around $40-60 each. Our experts recommend buying in bulk to save money and have backups when you need them. You’ll also need to replace your drum after extended periods of time. The lifespan of a printer drum depends on the manufacturer. Starting models have drums that last for around 12,000 pages. A good indicator of a worn out drum is if your print quality suddenly drops. There’s nothing more annoying than a printer with technical problems. But before rushing to repair shop, there are a few ways to fix common problems. Harmon stated that the leading reason for technical problems is either due to inappropriately placed toner or paper. He told us “if you make the mistake of using the wrong paper, it can cause problems [and] gray lines running through your document could mean that you placed the toner wrong.” His advice is to make sure your paper and toner are placed correctly. In addition, he recommends checking to see if you have selected the right paper settings for the printer. For example, if you want to print an envelope but have the settings set to plain paper, you’ll face problems. Printers can’t automatically adjust to paper type, so you’ll need to switch settings if you switch paper style. When the printer prompt comes up on your screen, there will be options for choosing the right style of paper. Pick a nice, clean spot for your printer. We learned from Craig that the biggest favor for your printer is “ensure that the environment is kept clean and dry because this will eliminate small particles from accumulating in the machine and keep dust from entering when the covers are opened.” In addition, he explained that the location of printer paper can have an effect too. “Paper that is sitting out will accumulate dust that will be distributed to the printer, and paper may have absorbed moisture causing it to stick together which can lead to a paper jam.” Luckily the solution is simple. Keep your printer paper in a box or drawer and gently fan it to shake off any dust before placing it in the printer.